Planning a holiday abroad for a family or large group can often feel like a military operation. Everyone’s individual needs have to be met, and it can often prove difficult to find a hotel that has the space and the facilities for lively groups. As a result, more and more people are turning to vacation villa rentals to make the most of their relaxation time. While some assume that a vacation rental means compromising on the 5* luxury offered by hotels, the reality can often be the opposite! Renting a luxury villa can offer you everything a 5* resort does ­ with the added bonus of having it all to yourselves. While hotels offer beautiful gardens, perfect pools and fine­dining restaurants, one thing they can’t offer is privacy. With a luxury villa rental, seclusion is the main objective. The importance of privacy when it comes to relaxing is underestimated. Whether you’re looking for some alone time with your partner or you don’t want to worry about the kids making a scene, a private villa rental means you can get comfortable, while enjoying the Mexican coast. And best of all? No more fighting for a spot at the pool or the beach, because it’s all yours! What sets Mexico apart from other travel destinations is the attention to detail, especially when it comes to service. A villa rental may afford you privacy, but that doesn’t mean jeopardising your 5* luxury experience! Forget about the days of cooking your own meals and planning your own trips while you’re on vacation. Many rental villas in Mexico come with the option of a full­time staff. Housekeepers, personal chefs and even events planners are all on hand, meaning you don’t have to lift a finger. 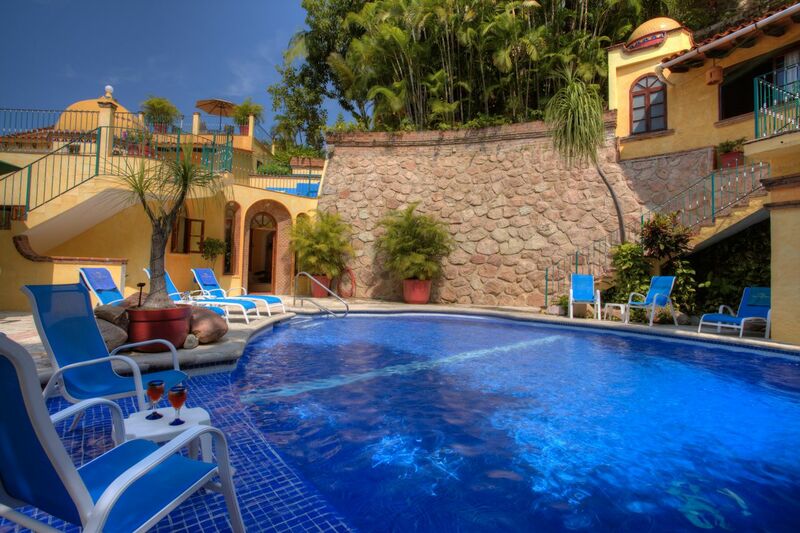 Mexico villa rentals can also offer a host of facilities. From games rooms to watersports gear, private beaches and party­perfect outdoor palapas fit with BBQs and fully­stocked bars ­ boredom is not an issue with a villa rental. It’s clear there are many perks to renting a villa. But one of the main reasons villa rentals are becoming so popular in Mexico is the way of life they represent. Mexican culture is known for being warm and welcoming. Renting a villa gives you access to living amongst the locals that large resorts and hotels just can’t offer. Enjoy your vacation at your own pace and live like a local in your new home­away­from­home. Villa rentals in Mexico are generally priced in U.S. Dollars unless otherwise stated. There are thousands of beautiful villas available in Mexico. That being said, every villa will offer different facilities with a different level of luxury. Before you start your search, make sure you have a clear idea of your budget, what you need and, more importantly, what would make your trip extra special. Only work with professional, trustworthy villa specialists to ensure that you get what you pay for. What looks good on paper doesn’t always live up to the hype in real life. Renting a villa is a very popular vacation option in Mexico. To avoid disappointment and to ensure you get your pick of the spoils, make sure you book well in advance. This is especially important ahead of the high­season which generally runs from December to April. Don’t let the initial price put you off. If compared to the same stay in a hotel resort, families usually find that villa rentals are the same price if not cheaper, with all the added bonuses. Los Cabosis a certified party place in a unique landscape, that also offers a surprising shot of culture. Send out your birthday invitations and quad bike through the desert with your friends, go deep­sea fishing in the Sea of Cortez and then head to the art­walk to sample some local creations. Punta Mitais the secret hideaway of the world’s rich and famous, and now it’s available to you. Super exclusive beach bars, world­class golf courses and bucket­list inspired activities are all on offer in this private patch of land at the northern peak of Banderas Bay. Horseback riding through the ocean is the best way to watch a sunset. Puerto Vallartais a romantic get­away, well­known for being frequented by famous lovers Liz Taylor and Richard Burton in the 70’s. Stroll down El Malecón promenade, wonder along the cobblestoned streets of the Zona Romantica and relax on some of the beautifully preserved beaches that are lined with lush jungle. Riviera Maya holds a host of vacation destinations that are not to be missed. From Playa Del Carmen, the #1 destination in Mexico, to bohemian Tulum and everywhere in between ­ a vacation in the Riviera Maya means getting back to nature without ever compromising on life’s little luxuries. So what are you waiting for? Your new Mexican home­away­from­home awaits!